As I wait for the next UFO to be announced on Feb 1 at Patchwork Times, I am finishing up the Tarted up Pineapple table runner from my class at Road. I have all the blocks done and ready to sew together. I may also add a border or two, but not sure yet how I will finish. This was a fun and easy way to make pineapple blocks, without the hassle of papers. I also had some time to work on another Lucy Boston Block. 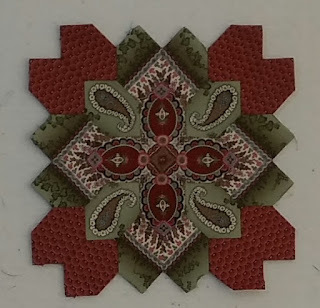 Lucy Boston #6 is fabulous... Love how you fussy cut the green paisley.